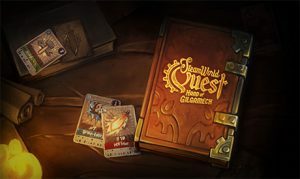 Coming exclusively to the eShop for the foreseeable future, SteamWorld Quest will be released on April 25th for $24.99 It’ll feature card-based battles, RPG elements (crafting and such), and more – all tied to the SteamWorld universe; we’re expecting some connection to past titles. “The SteamWorld community has asked us to make an RPG for a long time, so I’m really happy and satisfied that we’re delivering such a polished title way sooner than anyone expected,” says Brjánn Sigurgeirsson, CEO at Image & Form. Sooner than later is always a good thing. Though, I’m a little concerned about April. With World War Z, Days Gone, and Mortal Kombat 11, there’s a ton dropping that month. Hopefully, SteamWorld Quest: Hand of Gilgamech doesn’t get overshadowed. SteamWorld series returns with a roleplaying, collectible card game.